Verified Businesses is positioned as a consistent, open and reliable service provider who gets RESULTS FOR BOTH BUYERS AND SELLERS. We provide a high level of transparency not seen anywhere else within the industry. An example of which, is our communication of ‘HOW’ we established the ask price for each business and ‘WHY’, which is detailed in each information memorandum supplied to both buyers and sellers alike, and can be easily referred to by Accountants and financial advisors. Verified Businesses was established in 2010. Verified Businesses is totally focused on listing businesses to successfully sell them - not just listing for the sake of listing. In doing so, our objective is to provide all of our clients with the highest levels of service and advice possible. The current principal, Craig Campbell, has worked as a business broker on the Sunshine Coast for the past 9 years, and has an excellent 30-year background in running, owning and selling businesses. Being a proven and highly effective operator in management, marketing and business development. Craig is a Registered Business Valuer (RBV) and Certified Practicing Business Broker (CPBB), and his team of professionals are a truly unique resource to draw upon when it comes to selling or buying businesses. In fact, at Verified Businesses, we have five highly experienced BUSINESS BROKERS (see more about our brokers), who have all owned their own businesses, have a background in business management, and are members of the Australian Institute of Business Brokers (AIBB). All are professionally trained to assist buy or sell your business in today’s competitive environment. 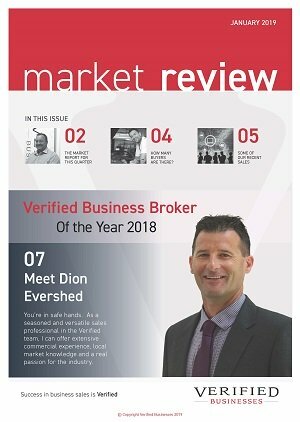 Since 2010, Verified Businesses has literally sold hundreds of businesses and has earned the reputation as one of the most reputable Business Brokerages in South East Queensland. This has been achieved through maintaining a high level of professionalism, honesty and integrity. An enviable standard we intend to maintain. This means as a SELLER (see sellers tool kit) or BUYER (see buyers info) you can rely on the Brokers at Verified Businesses telling you exactly how it is, as we will always endeavour to give you a true assessment of a business’s market value and likely selling range, as well as its strengths, weaknesses, opportunities and threats at any given time. We have an EXISTING database pool of hundreds of potential buyers who we’ve known for years here on the Sunshine Coast. These are people who have bought business after business through us over the years and who are always looking to move up to something new and better. These are often professional business people who already have a high success record. In addition to this, we get enquiries every day from NEW potential buyers who are looking for all sorts of businesses because they’ve already heard of our solid reputation, extensive market coverage, and success rate in selling businesses large and small. WHATS EXCITING TODAY is there are the hundreds of people from interstate and overseas who want to move to the fast growing and beautiful Sunshine Coast, and who are ready to buy a good business and will pay the right money for it. Many of which have heard about us from people who’ve already moved here and bought businesses, or simply found us on the web through google, as we’re one of the highest rating Business Broking websites on the Sunshine Coast.